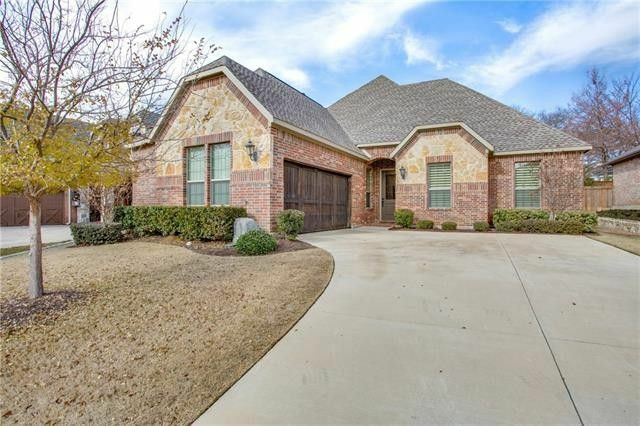 Built in Thistle Hill Estates in 2014, this elegant one-story brick&stone home offers hand-scraped wood floors in the entry,living room,dining room, kitchen &breakfast rm. Upscale granite countertops on all cabinets, Knotty Alder cabinets & Plantation Shutters on all windows! With ample cabinet storage & 9 ft. pantry, the opulent kitchen is open to the 13X10 breakfast area & living room with corner stone fireplace. The secluded 20X15 master suite's bathroom has a large glassed shower, garden tub, dual sinks in granite topped vanity & big walkin closet. Guest bedrooms,separated from the master suite. The 14X12 dining rm could make an ideal study off the grand entryway. The 24X13 patio offers fine outdoor living! Directions: From I-35, take Lillian Miller Parkway (becomes Teasley Ln at CVS Pharmacy. Continue straight on. Turn right onto Ryan Rd. Turn left onto Andrew Ave in Thistle Hill Estates, right on Thistle Ridge, 6th house on the right.